This is a fine c.1800 map of Asia by Alexandre Blondeau. It covers the entire continent from Africa and the Mediterranean east to the Bering Sea and south as far as Java and New Guinea. This map is most interesting in its rendering of the largely unexplored extreme northwest of Asia. Knowledge of this area was, at the time, speculative at best. Showa a misshapen representation of Japan, Hokkaido, Sakhalin Island, Kamchatka and Korea. The sea between Japan and Korea, whose name, either the 'Sea of Korea,' 'East Sea,' or the 'Sea of Japan,' is here identified in favor of Korea (G. de Coree). Historically, Korea has used the term 'East Sea' since 59 B.C., and many books published before the Japanese annexed Korea make references to the 'East Sea' or 'Sea of Korea.' Over time, neighboring and western countries have identified Korea's East Sea using various different terms. 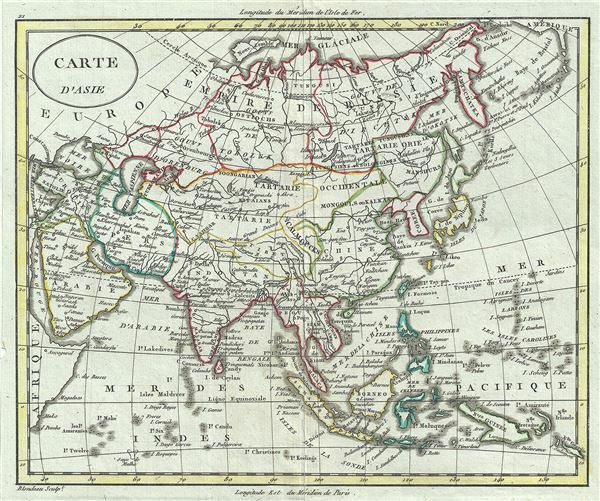 The St. Petersburg Academy of Sciences referred to the East Sea as 'Koreiskoe Mope' or 'Sea of Korea' in their 1745 map of Asia. Other seventeenth and 18th century Russian maps alternate between 'Sea of Korea' and 'Eastern Ocean.' The 18th century Russian and French explorers Adam Johan von Krusenstern and La Perouse called it the 'Sea of Japan,' a term that became popular worldwide. Nonetheless, the last official map published by the Russians name the East Sea the 'Sea of Korea.' The name is currently still a matter of historical and political dispute between the countries. This map was engraved by Alexandre Blondeau. The sea between Japan and Korea, whose name, either the 'Sea of Korea', 'East Sea', or the 'Sea of Japan,' is here identified in favor of Korea (G. de Coree). Historically, Korea has used the term 'East Sea' since 59 B.C., and many books published before the Japanese annexed Korea make references to the 'East Sea' or 'Sea of Korea'. Over time, neighboring and western countries have identified Korea's East Sea using various different terms. The St. Petersburg Academy of Sciences referred to the East Sea as 'Koreiskoe Mope' or 'Sea of Korea' in their 1745 map of Asia. Other seventeenth and 18th century Russian maps alternate between 'Sea of Korea' and 'Eastern Ocean'. The 18th century Russian and French explorers Adam Johan von Krusenstern and La Perouse called it the 'Sea of Japan', a term that became popular worldwide. Nonetheless, the last official map published by the Russians name the East Sea the 'Sea of Korea'. The name is currently still a matter of historical and political dispute between the countries. University of Southern California, Sea of Korea Map Collection, map no. EAMC-38.